Some books you just can't wait for. I was on the hold list for Station Eleven at my library for two long months before finally realizing the ebook is on sale for $6. For one of the most-hyped books of the year, I figured it was a safe bet. I jumped out of the hold line in a blur of excitement and purple hair extensions. 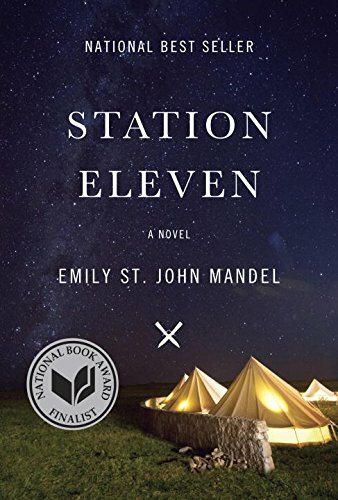 Station Eleven centers around a handful of compelling characters, depicting their lives both before and after the world is nearly destroyed by the Georgia Flu. You'd think a dystopian novel would be primarily about the crisis, the incident that brought humankind to its knees, but Mandel doesn't dwell on the devastation of the first few days and weeks. Instead, we get to follow a Traveling Symphony as they go from town to town performing Shakespeare. We watch survivors of the epidemic cobble together a living from ingeniously salvaged items. We see our world, broken down and remade, and with relief, recognize that some of the best elements still endure. If you're looking for a post-apocalyptic nightmare scenario with zombies and gratuitous violence, you will not find that in Station Eleven. But you will get something much better and more original. This one is definitely worth a purchase or, if you have the patience for it, a long wait at the library.